Ideology and a vast age gap mark public attitudes about gay marriage, supported in the latest ABC News/Washington Post poll by 77 percent of adults under age 30 - vs. just half as many seniors. Most Americans overall, 56 percent, support allowing gays and lesbians to marry legally, not significantly different from the all-time high, 59 percent, three months ago, and a majority consistently since crossing that line in early 2011. Thirty-eight percent are opposed. See PDF with full results and charts here. Half also see gay marriage as a constitutional right, vs. 43 percent who don't - a key question making its way to the doorstep of the U.S. Supreme Court. A string of federal courts have handed down rulings in favor of gay marriage since the high court found part of the federal Defense of Marriage Act unconstitutional a year ago . Gay marriages now are legal in 19 states and Washington, D.C. Despite the flurry of court action, the issue's not on the front burner in this year's midterm elections: A third of Americans say gay marriage is important to their vote preferences, last on a list of eight issues. By contrast, 84 percent call the economy a top concern, and it's about seven in 10 apiece for the deficit, the new health care law and "the way Washington is working." GROUPS - As noted, age and ideology are the biggest drivers of views on gay marriage. A statistical analysis holding other factors constant, including partisanship, finds that these two are the strongest independent correlates of attitudes on the issue. Topline data in this poll, produced for ABC by Langer Research Associates, support that conclusion. In addition to 77 percent of 18- to 29-year-olds (63 percent "strongly"), gay marriage is broadly backed by 30- to 39-year-olds, 68 percent. That falls to half of 40- to 64-year-olds, and bottoms out at 38 percent of seniors. Similarly, it's favored by 84 and 62 percent of liberals and moderates, vs. just 37 and 22 percent of "somewhat" and "very" conservatives, respectively. While those two are the strongest independent predictors, partisanship and religion also bear a close relationship to opinions on gay marriage. Support is much higher among Democrats and political independents than Republicans (67 and 58 percent, vs. 37 percent, respectively). And just 28 percent of evangelical Protestants back gay marriage, compared with 61 percent of Catholics, 65 percent of non-evangelical Protestants and 82 percent of those with no religious affiliation. Fifty-eight percent of whites overall support gay marriage, including, notably, 75 percent of white women with a college degree. Support is significantly lower among blacks, 44 percent. Hispanics fall between the two, at 52 percent support. 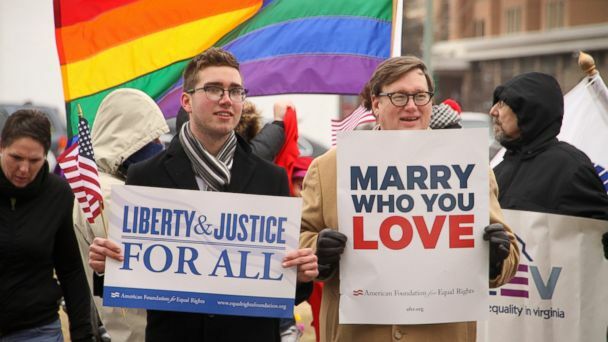 There's greater-than-average support for gay marriage among Northeasterners, college graduates, $100,000-plus income earners and opponents of the Tea Party movement. And support falls below a majority among Southerners, those who haven't gone beyond high school, those living in rural areas and Tea Party supporters. METHODOLOGY - This ABC News/Washington Post poll was conducted by telephone May 29-June 1, 2014, in English and Spanish, among a random national sample of 1,002 adults, including landline and cell-phone-only respondents. Results have a margin of sampling error of 3.5 points, including design effect.